In a small skillet over medium heat, melt the butter until foamy. Sprinkle in the brown sugar and stir with a heat-proof spatula to combine. Continue stirring over medium heat until sugar melts, taking care not to splash as mixture will be very hot. When sugar is melted and bubbling, carefully lay the pear slices in the pan, being careful not to crowd. Allow to cook on one side for about 1-2 minutes then carefully turn over. Remove from pan when soft but not falling apart; timing will depend on thickness of cut. Some sugar may crystallize from moisture in the pear. Pour any remaining un-crystallized sugar over pear slices. 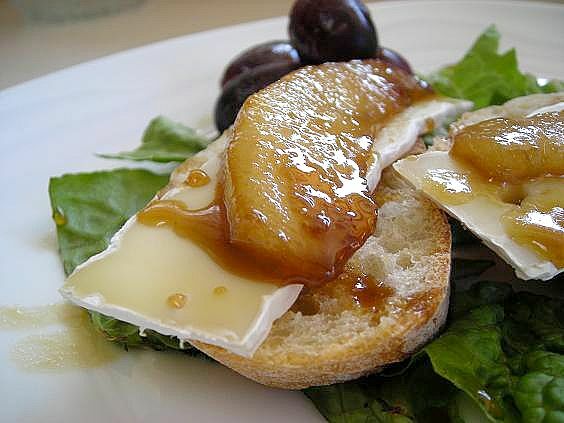 Lay one slice Ile De France Camembert cheese on top of sliced baguette and top with one slice of glazed pear. Drizzle some melted sugar over top and a fine dusting of grey sea salt. Serve at once accompanied by red grapes, a dry champagne or a chilled late harvest Riesling. This recipe has been submitted to Ile De France Cheese for their Spring Follies Recipe Contest. Recipes can be submitted through the Ile De France website up until April 29th. Rating recipes begins May 1st and ends May 31st. Four prizes will be awarded. Please see the website for more details. 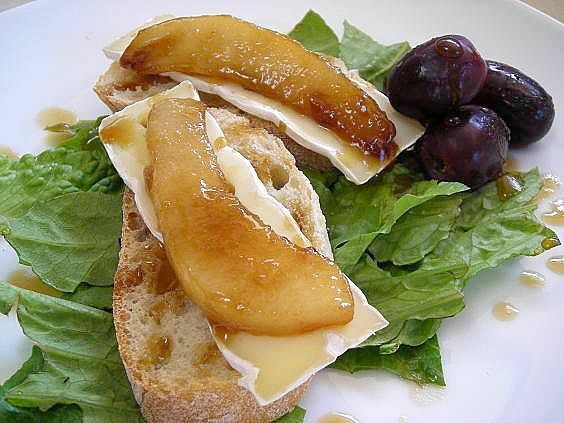 The perfect, elegant combo: cheese ‘n fruit ‘n bread– scrum DIDDLY! I like the method you used for preparing the pears here. This is totally something I would bring to a potluck or dinner party. And can I just tell you how hilarious I think it is that your cats have their own blog???? I have two adorable felines myself, and I find very few people who are sympathetic about my obsession with them! I have words! It would be a perfect dinner for me paired with a crisp buttery chardonnay! 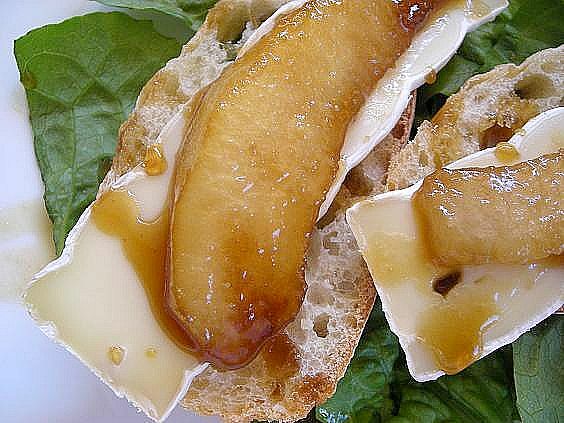 I promised you I gasped when I saw that gorgeously roasted fruit on top of beautiful brie. Oh my oh my oh my! No words are needed! I’ve gotta admit – that looks fantastic…really good! Wordless? Me? For one whole day? I would never be able to do it, but, Kate, I have to admit, these photos left me speechless! Hubby would go nuts for this beautiful treat! That looks great!! What a unique recipe idea. I guess you’d probably eat it with a fork and knife? ?